It’s a common alignment problem: ROTATION. 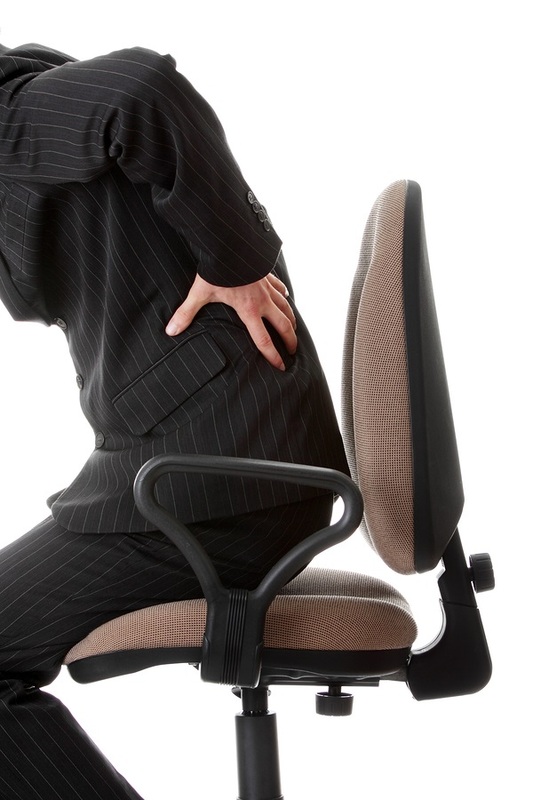 Rotation issues can cause dysfuntion such as hip pain, back pain, and knee pain. Where does it come from? Who knows exactly. Maybe you crossed your legs the same way every day for years on end. Or your dominant hand/leg has taken over your non-dominant side, creating a natural rotation in the body. A shorter leg can cause these issues, as well as something simple like sleeping on the same side for years on end. It’s important to figure out what is causing the rotation. However, even more important, is to learn exercises that will bring you back to balance. When I’m working with a client who has rotation, I address it one of two ways, and a visual assessment helps me to determine which approach would be the best solution. Often times the rotation actually presents heavily in the hips. This is sometimes causes by leg length discrepancies, excessive leg crossing, or by sports such as golf or baseball. For hip imbalances, I introduce a new exercise based on an old yoga posture. I call it Wall Triangle, and it can be a powerful exercise when done correctly. 2. Make sure both glutes are against the wall. Bring the arms out to a T position, placing the head, both shoulders and hands against the wall. 3. Lean the upper body down to the left as far as you can, keeping the hands, shoulders and glutes up against the wall. 4. Use your abdominals to stabilize and hold this position for 30 seconds to 1 minute . Now, I must CAUTION YOU! This exercise can be very challenging to hold and can create some powerful change in the body. If you are feeling any discomfort, back out of the exercise and try holding a shorter period of time, or don’t lower your upper body down too far. The most important piece of this exercise is the glute alignment on the wall, and the feet and leg positions. Give it a try and please comment below on how it felt. I read every comment and respond to every email I receive! You’ve heard that the combination of diet and exercise will help you to shed those unwanted pounds; but how about good posture? When mom was nagging you to sit up straight, was she positively impacting your ability to maintain your youthful figure? As a Certified Posture Specialist, I study the positive effects of biomechanically correct posture and how it affects the way the body feels. Neck pain, back pain and knee pain are all reduced with proper alignment building exercises. My life’s work is teaching clients to improve their poor posture from sitting all day long by stretching their anterior muscles, and strengthening their posterior muscles. Adding posture building exercises to your daily life can add muscle mass, which in turn can assist with weight loss, but research has now shown that holding powerful posture positions, can influence your hormones to make you a fat burning machine. The scientific link begins with the work of Harvard based Social Psychologist Amy Cuddy, whose 2012 Ted Talk became one of the most widely viewed talks in history. In her talk, she reported results from her 2010 study that links holding a powerful poses (hands on hips, chest high) with higher levels of testosterone and lower levels of cortisol. The foundation of this theory is supported by a previous study conducted in 2004, of participants who held a yoga “cobra pose” (aggressive back extension posture demonstrated here) and took blood tests before and after the pose. This study showed an increase in testosterone by 16% and a decrease in cortisol by 11%. Now we know the link between holding your body in a posture positive position, and the effect on these two important hormones, testosterone and cortisol. Let’s now analyze how these important hormones can affect your ability to lose weight. Testosterone is a hormone that has been shown to increase muscles mass. Since the hormone is clearly more predominant in men, it’s the reason why men tend to bulk up and slim down way faster than women. This 2014 review links testosterone therapy with weight loss and a lowering of their body mass index. Cortisol is a hormone that is released by the body when there is external stress. This study conducted in 1994 indicates that women with a higher waist to hip ration (or more abdominal fat) had higher levels of cortisol in their salivary glands. The study links the presence of cortisol, with body fat distribution. So, with this empirical evidence, we can link posture based exercises and holding powerful posture positions, to hormonally making it easier to lose weight. In addition to the scientific research, let’s also take a look at the common sense evidence behind standing taller and improving your posture. When we slouch, we shorten the distance from our shoulders to our hips, thereby compressing the fat tissue into a smaller space and forcing it to protrude out. If someone is holding an anterior tilt position in the pelvis (aka lordosis, or an excessively arched lower curvature in the back), this means the glutes stick out further than they should, giving them an appearance of being bigger. 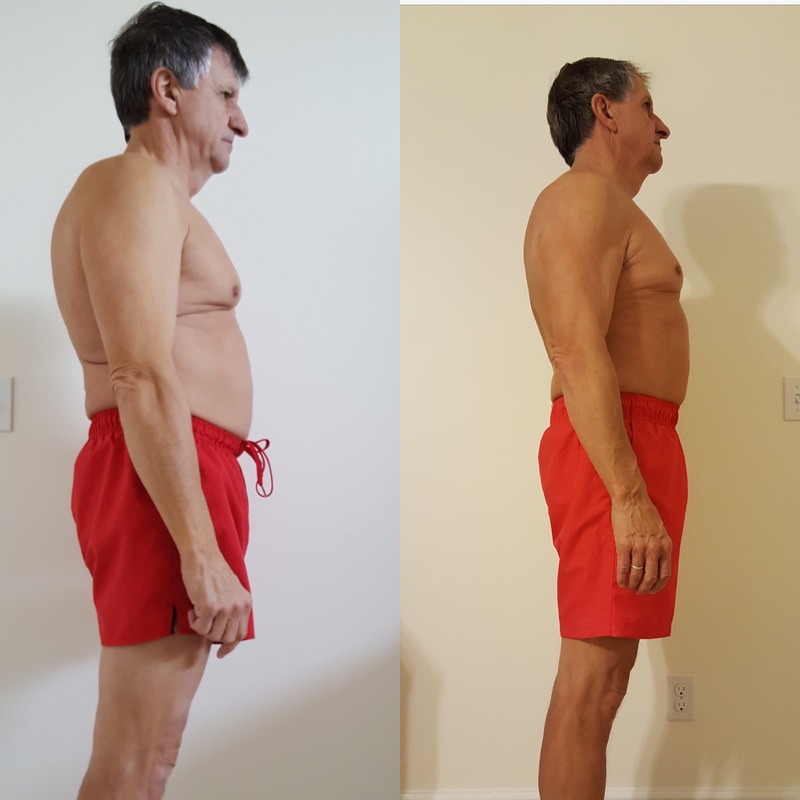 With the head properly aligned and the shoulder placement more pronounced backwards, the abdominal area pulls in and the appearance is that of a taller, fitter client. Now that you’re convinced, what exercises should you be doing to impact the hormones, and improve your posture? The scientific research in this arena all point to “holding” these positions for lengths of time. Here is a 7 minute daily workout routine of 7 different exercises. All of these exercises are designed to open the body into powerful postures, and each one is held for one minute . Also included in this 7 minute routine, are exercises or stretches (both are included) that open up the posterior muscles that need work as a result of sitting all day long, and stretching the anterior muscles that end up tight from rounding forward. For detailed descriptions of exactly how to do each exercise and picture demonstrations, visit here. Chest Stretch on a Roller- one of the surefire, best feeling exercises around! This position opens the chest, stretches the super tight pectorals, and literally opens the heart to the universe. Most people need to do this stretch daily from a biomechanics perspective (their pectorals are tight). In keeping with the powerful posture hormone boosting theory, this position opens your body up easily and completely. Don’t have a roller? Try a large stability ball or a pillow to elevate the body so the arms fall lower than the torso for the ultimate stretch. Basic Back Extension– a safer and easier to do correctly version of the Yoga cobra. The basic back extension exercise involves opening the chest and strengthening the middle back muscles. Different from the cobra, it places less stress on the lumbar spine, which is probably not ready for extreme extension if you haven’t done posture exercise in a while. Lift to the back extension position, and hold this position for 1 minute. Pelvic Curl– this is a common exercise seen in many core exercise programs., In this instance, holding the position at the top will maximize the chest expansion and hip extension element of this movement. The glutes will fire to bring strength to the posterior chain, and working these larger leg muscles also contributes to testosterone production. Lift to the top of the bridge like position, and hold for 1 minute. Tabletop Chest Opener– arguably the most difficult exercise of this series. This one may take time to build up to 1 minute. It’s an extreme chest opening and works the posterior muscles heavily. When done properly, this is a mind blowing effective way to feel powerful in the chest opening stance. Deadlift with Raised Arms– this may not look like a deadlift since you’re not handling heavy weights in front of you, but the hip hinging element of the bend works the hamstrings, glutes and lower back the same way a weighted deadlift would work. The added element of the raised arms creates extra load on the back muscles, and an opening-up of the upper body simultaneously. Hold this position and pull your abs in, while feeling your whole back wake up. 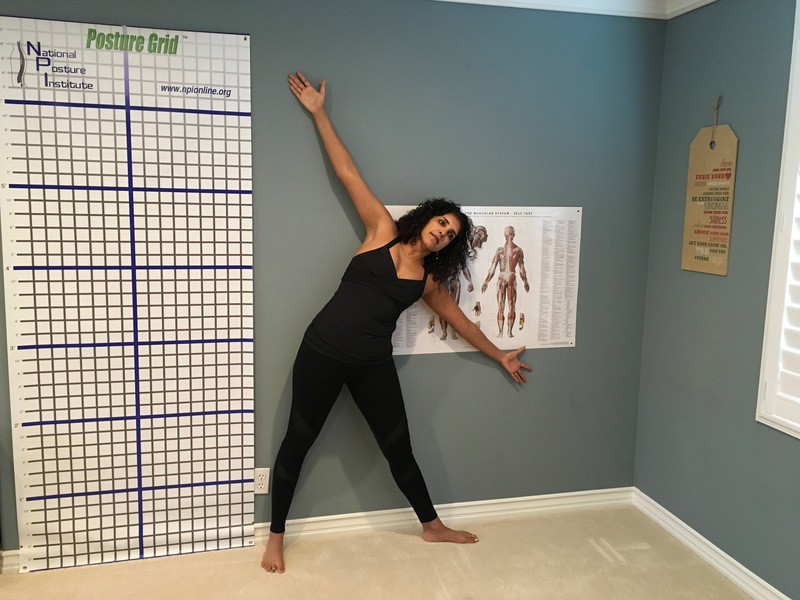 Wall Stand– this is a common posture strengthening exercise that is far more difficult to do than it seems. Standing forward from the wall 4 to 6 inches maximizes the chances of success, and the higher the arms, the more difficult the hold. The goal is to get the head, upper back, mid back, glutes, and back of the whole arms against the wall for the whole minute. Doorway Hanging Chest Stretch- we finish with an amazing feel good stretch that you can do anytime, anywhere. Learn forward, open up, and embrace the feeling of power in this finishing posture defining pose. Can you provide a picture for each poses? It would prevent people from doing it wrong, and likely prevent any injury. This routine takes 7 minutes and highlights 7 exercises which place your body in 7 powerful positions to increase the hormone regulating, muscle building, and body lengthening power that exercise can contribute to your body changing goals. Get this workout delivered to your inbox with detailed instructions and pictures on how to perform each exercise here. Remember, only 7 minutes a day! 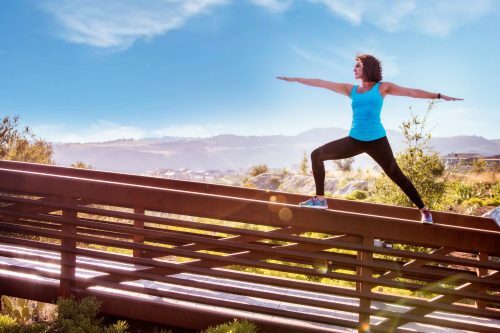 Integrate powerful poses into your daily routine to maximize your efforts towards better posture, a stronger body, and a healthy body weight. As mom used to day… “sit up straight!”.